If your height exceeds 6’2” (74”), you might like to wear tall-sized clothing? If your neck size exceeds 17 ½” and your sleeve is longer than 35” it might be difficult to find shirts that fit you? Find the size you need, up to 22” neck and 39” sleeve, at Downtown Clothing Company in the Hutchinson (MN) Mall or at www.downtownclothingcompany.com. Are you ready for our biggest sale ever? 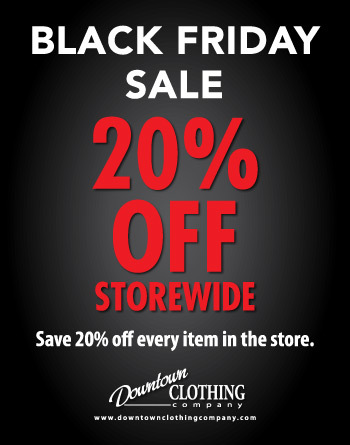 This Friday, Saturday, and Sunday, to kick off the holiday shopping season, we are offering 20% everything in the store! WOW! Come see all the great clothing and accessories we have in stock. June is such a fantastic month for celebration! Not only do we get to celebrate all of the dads out there, we also get to celebrate all the joy that is graduation. At Downtown Clothing, we hate to miss out on a good celebration so we're offering a discount all during June. Print off and bring in the coupon below for $10 off any regularly priced item $25 or higher. Come on in and see what we have to offer. You'll be amazed at our fantastic selection and unparalleled service in Hutchinson. Welcome to our new website! We're making changes to serve you better including this new website and our corresponding facebook page. Help us spread the word about great clothing and service in Hutchinson by sharing this with your friends! Need a stunning tuxedo for your upcoming prom? Come to Downtown Clothing in the Hutchinson Mall and see all of our offerings from Milroy's Tuxedos. See all of the great styles and color combinations for this year's prom! Help us spread the word about our prom tuxedo rentals! Click the Like button below. When you come into the store, we'll give you $10 off your tuxedo rental for helping us spread the news.